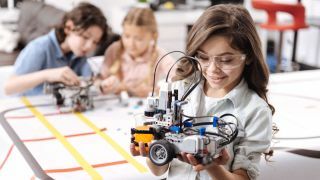 To meet the challenges of the modern workplace, today’s education is calling for curriculum that integrates STEM learning and creative problem solving in the classroom. I have found that creativity in the classroom is better harnessed when it is encouraged and is critical for today’s students, particularly when using robotics. One common misconception about creativity that many of my students have is that to be creative, you need to have a knack for drawing, painting or storytelling. What I try to teach through robotics is what I believe the true definition of creativity is: doing or thinking about things differently. I recently needed to help my middle school students understand what a two-stage rocket is and why it is important to modern rocketry. The challenge I gave them was to get a marshmallow as far across the floor as possible using a two-stage concept. Students had to build a device that could be robotically activated for the first stage which was a 5’ foot distance, the robot then had to deploy a second force to continue moving the marshmallow to the greatest distance possible. By being creative as teachers and incorporating robotics into our lesson plans, we can show students that it is possible for creativity to go hand in hand in math, science, coding and more. Robotics frequently present open-ended challenges that do not lead to single solution. Forcing students to experiment changes the way they think about approaching problems, and encourages them to get creative. Another challenge I conducted in the classroom involved moving tethered robots across a finish line without the use of human force. One group in this challenge created straws with the available materials so they could blow their robots across the finish line. This prompted an interactive discussion and “light bulb” moments where students think creatively within the parameters of a problem. Students who are not exposed to open-ended challenges can struggle with going against the conventional structure of a classroom, and will often search for what they perceive to be a single “correct” answer. It is important to reinforce to these students that the core of creative thinking involves an element of risk. During a study of famous artists I did with my 4th and 5th graders, students had to choose a work of art and then problem solve how to make that art work move using gears, servos, and programming. These students had very little to no experience with robotics so this was a bit frustrating for them at first as they learned the basics of robotics engineering. We had many of what of my students called “epic fails,” but the key was that they kept trying new things. This is what risk-taking is all about! While robotics may seem overwhelming at first, it is truly a great tool to implement in the classroom to promote a culture of creativity. Not only does it emphasize meaningful problem-based learning, it also offers unique applications for hands-on learning in cooperative groups, allowing students to gain important communication and teamwork skills necessary for the modern workplace. Lynne Boucher is the STEAM Director and Educator at Viera Charter School and a LEGO Education Ambassador Program (LEAP) teacher.